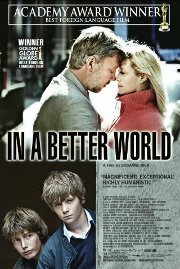 A provocative film that explores the difficult choices between revenge and forgiveness, In a Better World follows two Danish families and the unusual and dangerous friendship that develops between them. Bullied at school, Elias is defended by Christian, a boy greatly troubled over his mother's death. So when the two become involved in an act of revenge with potentially tragic consequences, it's their parents who are left to help them come to terms with the complexity of human emotions, pain and empathy. In Danish and Swedish with English subtitles.